I'm Joanne, owner and creator of the shop. This shop and brand is a One person run place~ So Some times things can be a bit slow due to my crazy job in real life. So please be patience with me. I will try my best to get everyone's orders out as quickly and safely as possible! Thank you so much for your continuing support after all these years! Without you! This shop would not have existed! In the mean time. Please check out our Facebook page for all the latest news and update! Gorgeous wig and very well made. Hello everyone, my name is Joanne. Akasarushi is a name made up by me. I want a name where there's no multiple clashes among other web owners or users. So i made up a name formed by Japanese characters in the Japanese alphabet. I am a Graphic Designer, but I have love for designing clothes. Although i might love designing clothes, I know it's not the major for me. Therefore, I take it in as a hobby instead and it's working quite well. My first encounter with BJD is through myspace. I was browsing for sewing groups and bump into a BJD group somehow. At first I just thought they're simple pretty to look at. I saw the price and could never imagine myself owning one. 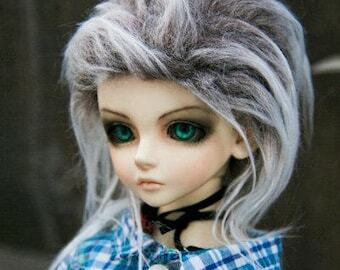 Well, one faithful crazy day, my heart beat up my brain and I ended up buying my first doll in March 2006. It was Kid-Delf ANI from LUTS. She's gorgeous and I love her dearly. Then Winter came, so i ended up purchasing my second doll, SOOM NAMU in Winter 2006. He was gorgeous! Unfortunately, he have to go because I later found out SD size are not for me. Finally, a year later after my first doll, on December 4, 2007, I've decided to purchase another, yet another LUTS product, Kid-Delf BORY. Curremtly, I am working on launching out own official site that will be home to all the things I love! It will run under the brand of "Moomoochi" where i will combine my love for all my hobbies into one place! I can hardly wait! I'm an artist, Designer, Photographer, Cosplayer, and a Proud Doll Owner! We Use USPS to ship out all our wigs. We do offer combine orders. Please allow us to have 3-9 days to process your order depending on wig colors. Shipping will be varies depending on location. Once ship. It should arrive any time from 3-5 days for US and up to two weeks or more for International.